The fall of the Berlin Wall in 1989 signaled the onset of tumultuous political, economic, and social reforms throughout Eastern Europe. In Czechoslovakia, Poland, and the Soviet Union these changes were linked to the activities and philosophies of political figures such as Václav Havel, Lech Walesa, and Mikhail Gorbachev. In Bulgaria, however, these changes were first heralded and even facilitated by particular musicians and shifting musical styles. 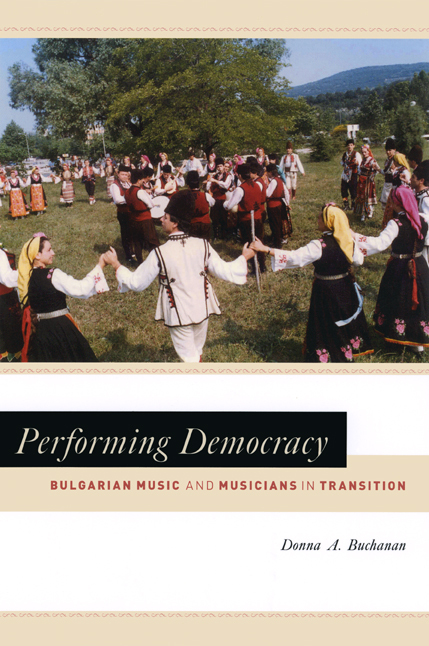 Based on fieldwork conducted between 1988 and 1996 with professional Bulgarian folk musicians, Donna A. Buchanan’s PerformingDemocracy argues that the performances of traditional music groups may be interpreted not only as harbingers but as agents of Bulgaria’s political transition. Many of the musicians in socialist Bulgaria’s state folk ensembles served as official cultural emissaries for several decades. Through their reminiscences and repertoires, Buchanan reveals the evolution of Bulgarian musical life as it responded to and informed the political process. By modifying their art to accommodate changing political ideologies, these musicians literally played out regime change on the world’s stages, performing their country’s democratization musically at home and abroad. Performing Democracy and its accompanying CD-ROM, featuring traditional Bulgarian music, lyrics, notation, and photos, will fascinate any reader interested in the many ways art echoes and influences politics. 6. "Cutting the National Crystal": The "Koutev Line"
"The power of the book comes primarily from Buchanan’s ability to address the historical question of post-socialist transition by weaving together rich ethnographic fieldnotes and knowledgeable ethnomusicological, discursive, and historiographical analyses. . . . Although this expansive book is first and foremost an ethnomusicological investigation, its value exceeds narrow disciplinary boundaries. For the particular needs of folklorists . . . Performing Democracy contributes a highly important approach." "[Buchanan] amply contextualizes and chronicles the rise and--if not complete demise, then at least rapid decline--of Bulgaria’s professional folk song and dance ensembles. . . . Through her musicological and ethnological anlyses of the individuals and groups who literally and visibly ’played out’ the sociopolitical changes of their times . . . Buchanan effectively argues against the marginalization of music as aesthetic frill of little relevance by demonstrating its centrality, potential and actual, to social and political life." "The book offers a fascinating, comprehensive, and informed account of music and nation buildong in the context of the intense sociopolitical changes that took place in Bulgaria. . . . [Buchanan’s] gifts as a brilliant storyteller bring another attractive quality that makes Performing Democracy a welcomed, challenging title in the world of contemporary ethnographic and anthropological scholarship."